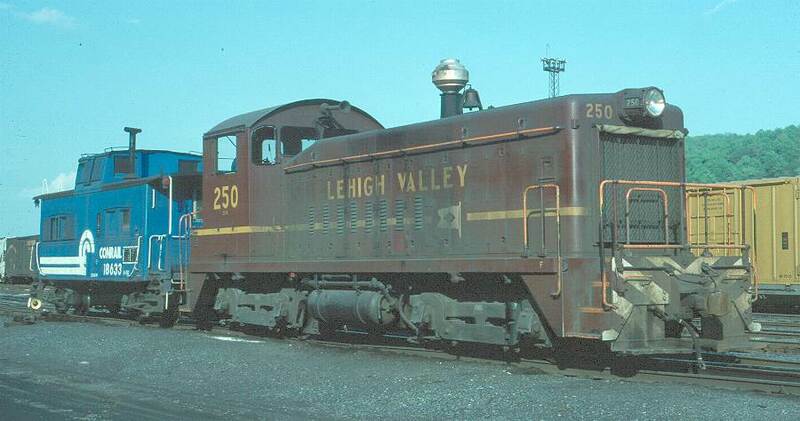 Lehigh Valley’s SW8s were delivered over a 24 month period between December 1950 and December 1952, in several variations. The major operational differences were the specially designed dynamic brake installation, unique to the Valley’s SW8s, and MU capability. All 18 of the DB equipped units had MU capability at both ends, with the attendant split railings and drop steps. 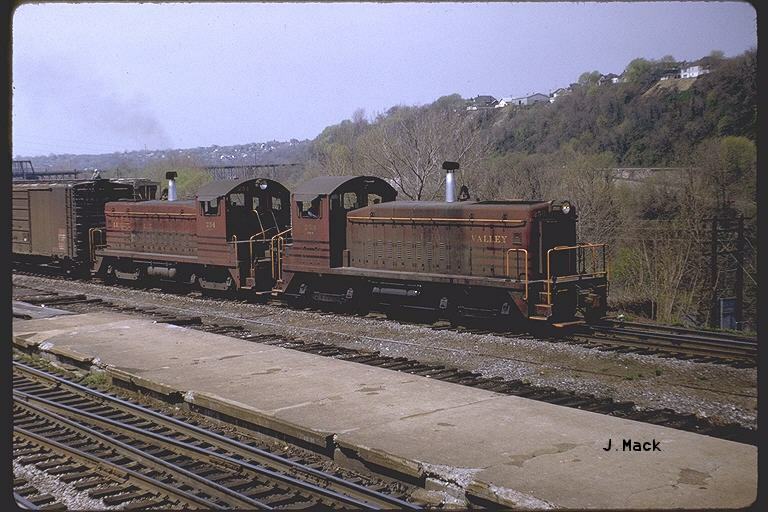 These were purchased specifically to run in groups of three to five, hauling anthracite on the M&H Division (later called the Hazelton Branch). Seven of the non-DB-equipped units had MU on the cab end only, with a straight end railing on the front end, so they could be run in pairs, back to back. At least one of these units was later retrofitted with MU on the front, but the railing was probably not changed. Two had no MU capability at all. 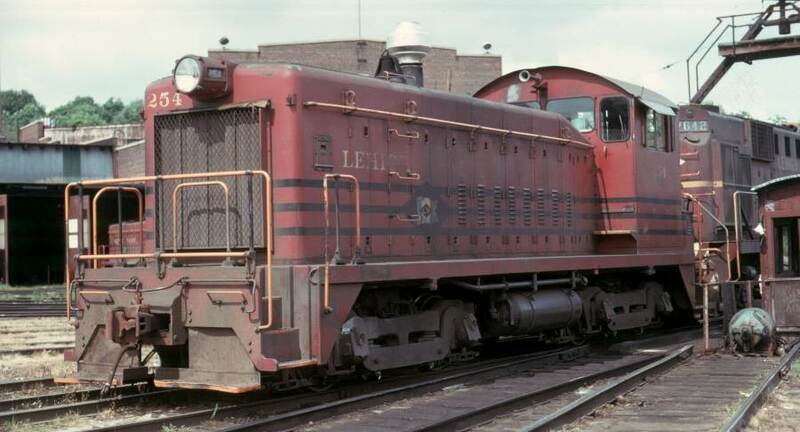 The other as-delivered variation was the use of single or dual headlights, probably a change in standard equipment by EMD between the delivery of the first and second batches. Other variations appeared as the SW8s were shopped, based on operating experience. The first were probably cloth radiator covers, to maintain operating temperatures in the Pocono winters, possibly by the end of 1952. Spark arrestors were also soon fitted, at first home-made half-round screens, which were oriented either front-to-back or crosswise in individual installations. Later, commercial Harco cyclone spark arrestors were fitted, in two sizes, probably as the result of at least two orders for them. Variations in horns can be seen in photos of some units, and at least one unit (264) had its front footboards replaced with a plow-like pilot. 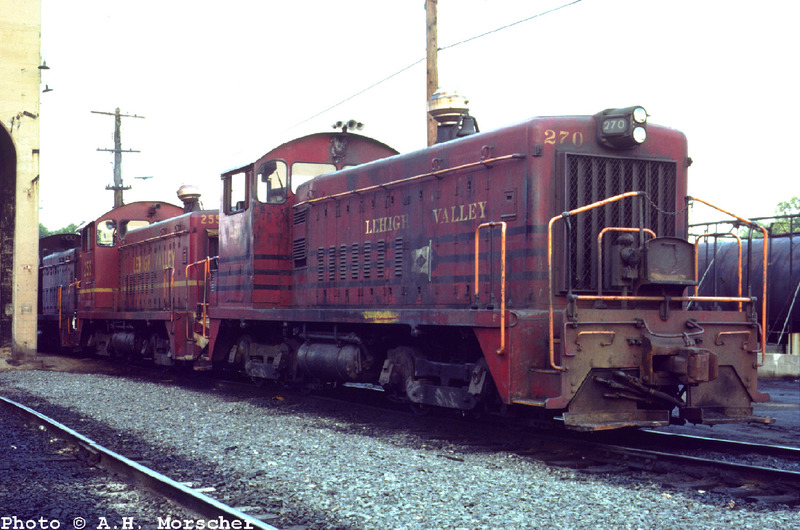 The original Cornell Red with black stripes paint scheme lasted until Conrail Day on 14 out of the Valley’s 27 SW8s. 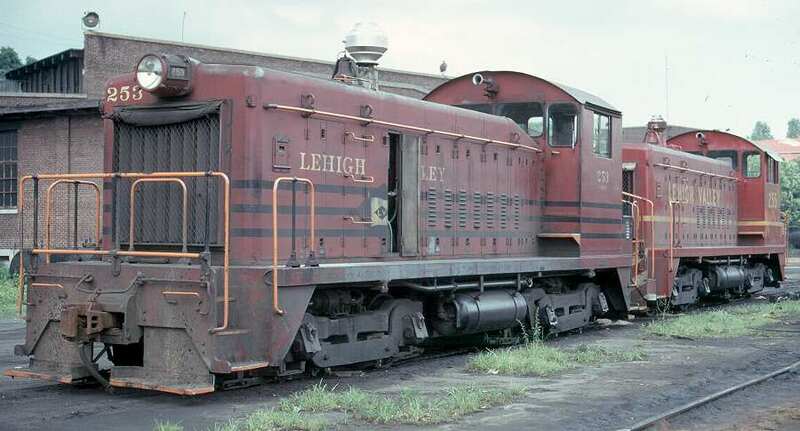 Three were repainted into variations of the Tuscan Red scheme in the 60s and early 70s, which again lasted until Conrail, while 10 got the final Cornell Red scheme with yellow stripe and gothic lettering. The table at the bottom of this page lists the details applicable to each unit. Bill Navari photo from George Elwood’s web site. Arnold Morscher photo. LV 250 is a standard SW8, with the characteristic sloped hood in front of the cab. It was in the first batch delivered to LV, and has MU on the cab end only. 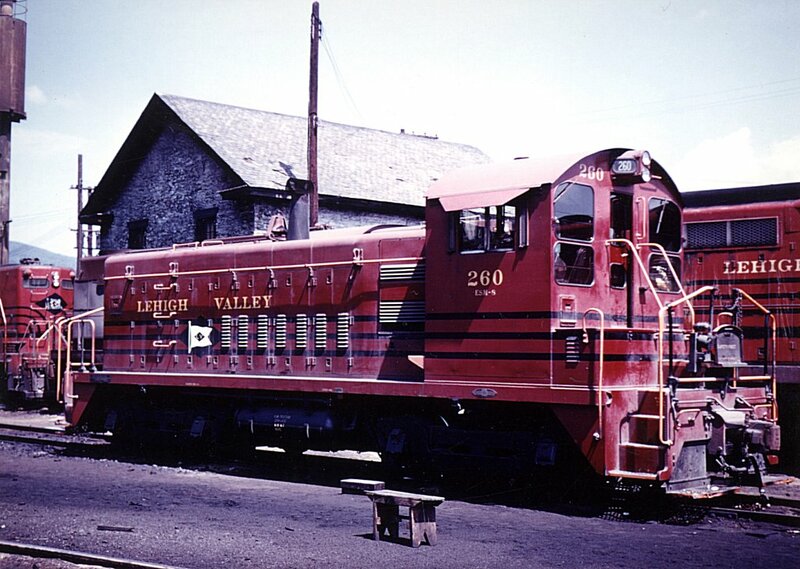 It is one of only three LV locomotives to wear a combination of Tuscan Red and gothic lettering. LV 261 shows the unique profile of LV’s dynamic-brake equipped SW8s. The DB fan is located atop the built-up section of the hood in front of the cab. These units have MU on both ends, and this one still wears the original paint scheme in 1977. The gray area above the side DB grille appears to be stripped of paint. The neat and unique dynamic brake installation worked out by EMD and LVRR’s mechanical department can be seen in the photos above. A 36 inch “cap-top” exhaust fan is located in a square panel atop the hood. Note the access hatch below the grill on the left side of the hood, while there is no panel on the right side. The grill panel assembly extends from the curve at the top of the hood to about 2/3 of the hood depth. The grill itself consists of four louvers above a blank plate, with six louver below, and a chicken-wire covered intake at the bottom. The ends of the louvers are capped by a sheet metal frame, highlighted by the sun in the photo at right. 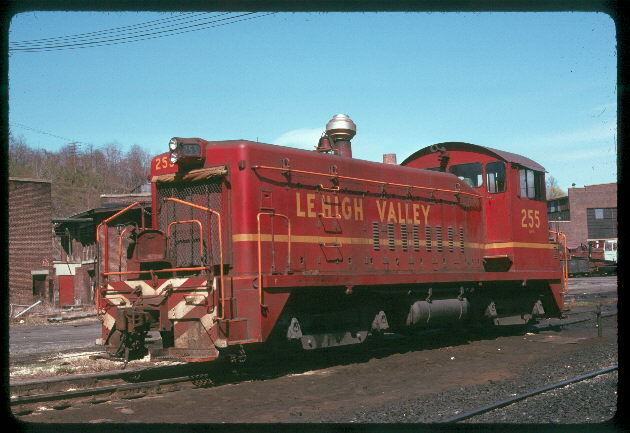 LV 253, in the original Cornell Red/three black stripes paint scheme, demonstrates a number of the major spotting features. It has the early style single headlight, and is not equipped with MU capability at the front. Also note the large centrifugal spark arrestor, which was used late in the career of LV’s SW8s. 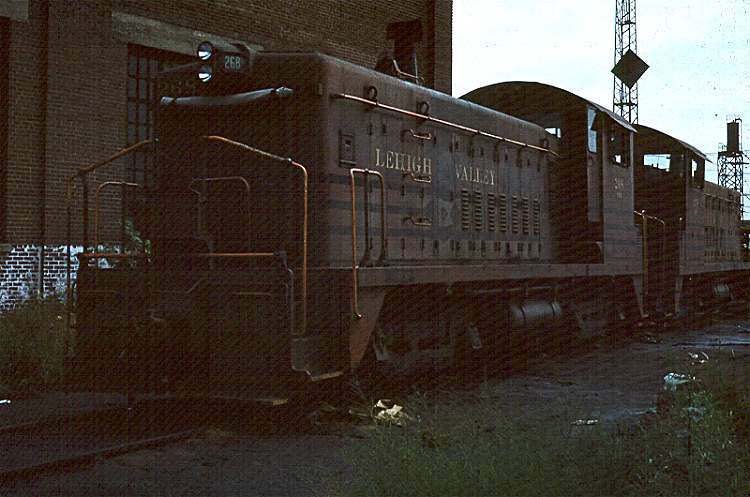 LV 257, in the late Cornell Red/yellow stripe scheme, has the later dual headlight, and is equipped for MU at both ends, so also has the split railing and drop step in front. In this photo, it sports the smaller centrifugal spark arrestor. Both 253 and 257 have standard pilots with footboards, and have been fitted with cloth radiator covers. 250 13151 12/1950 4/1972 – Style #6: Tuscan w yellow stripe, white flag & gothic lettering To CR as 8664 N 1 1 Photos by Bill Navari on George Ellwood’s web site show 8/72 and 4/77 views. 251 13152 12/1950 11/1964 – Style #4: Tuscan w yellow stripe, gray flag in diamond & Roman lettering To CR as 8665 N 1 1 Photo by Bill Navari on George Elwood’s web site. 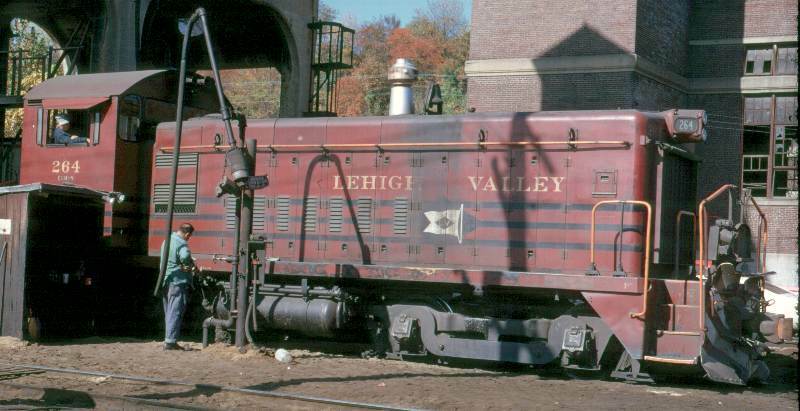 253 13154 12/1950 Never repainted to another scheme To CR as 8667 N 1 1 Photo by Bill Navari on George Elwood’s web site. 254 13155 12/1950 Never repainted to another scheme To CR as 8668 N 1 1 James Mack photo on Clint Chamberlin’s web site.Gary Steubben photo on George Ellwood’s web site. 255 13156 12/1950 10/1973 – Style # 11:Late Cornell Red, yellow stripe, no herald, gothic lettering. To CR as 8669 N 1 1 Photo on Clint Chamberlin’s web site.MU retrofitted to front end 10/73, and front railing style changed to split type. 257 14028 9/1951 6/1973 – Style # 11:Late Cornell Red, yellow stripe, no herald, gothic lettering. To CR as 8671 Y 2 2 Photo in original scheme by Frank Czajkowski on Clint Chamberlin’s web site.Photo in repaint scheme on Clint Chamberlin’s web site. 258 14029 9/1951 Never repainted to another scheme To CR as 8672 Y 2 2 B&W photo on Clint Chamberlin’s web site. 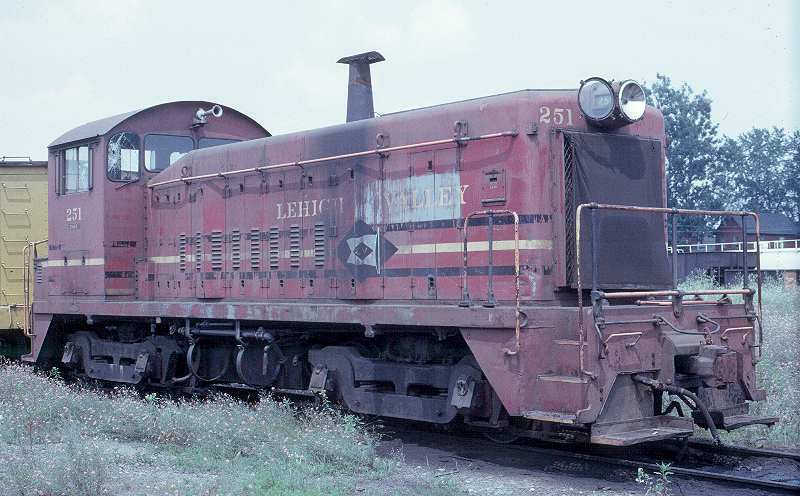 260 14031 9/1951 Never repainted to another scheme To CR as 8674 Y 2 2 Troy Smith photo on Clint Chamberlin’s web site. 261 14032 9/1951 Never repainted to another scheme To CR as 8675 Y 2 2 Arnold Morscher photo on his web site. 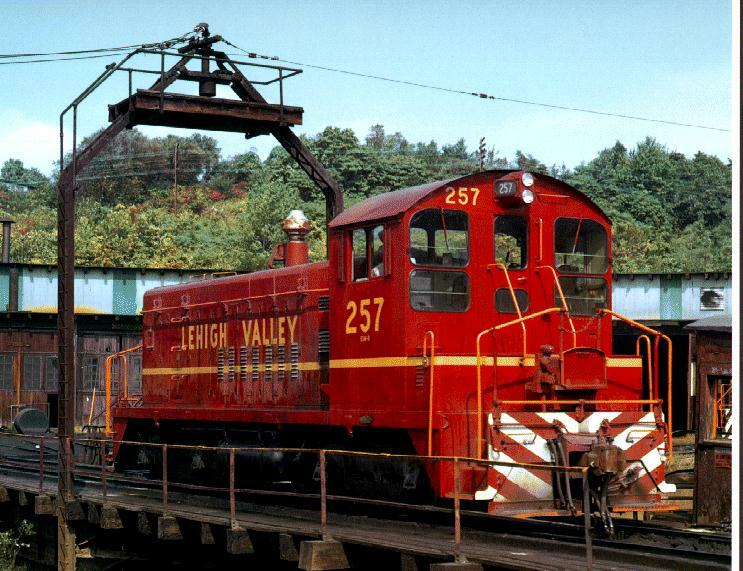 262 14056 9/1951 Never repainted to another scheme To CR as 8676 Y 2 2 Bill Navari photo on George Ellwood’s web site. 263 14057 9/1951 11/1972 – Style # 11:Late Cornell Red, yellow stripe, no herald, gothic lettering, but with lighter strokes in some letters, as in old LV style. To CR as 8677 Y 2 2 1974 photo by Gary Steubben on George Elwood’s web site. 264 14489 9/1951 2/1975 – Style # 11:Late Cornell Red, yellow stripe, no herald, gothic lettering. To CR as 8678 Y 2 2 Photo by Gary Steubben on George Elwood’s web site, showing plow pilot with black & white stripes applied sometime before full repaint in 2/1975 – body still in original Cornell Red scheme. 266 14491 9/1951 Never repainted to another scheme To CR as 8680 Y 2 2 1974 photo by Gary Steubben on George Elwood’s web site. 268 14493 9/1951 8/1974 – Style # 11:Late Cornell Red, yellow stripe, no herald, gothic lettering. To CR as 8682 Y 2 2 Photo by Jerome Rosenfeld on George Elwood’s web site shows original paint scheme. Photo by Jim Parker on George Elwood’s site shows repaint scheme. 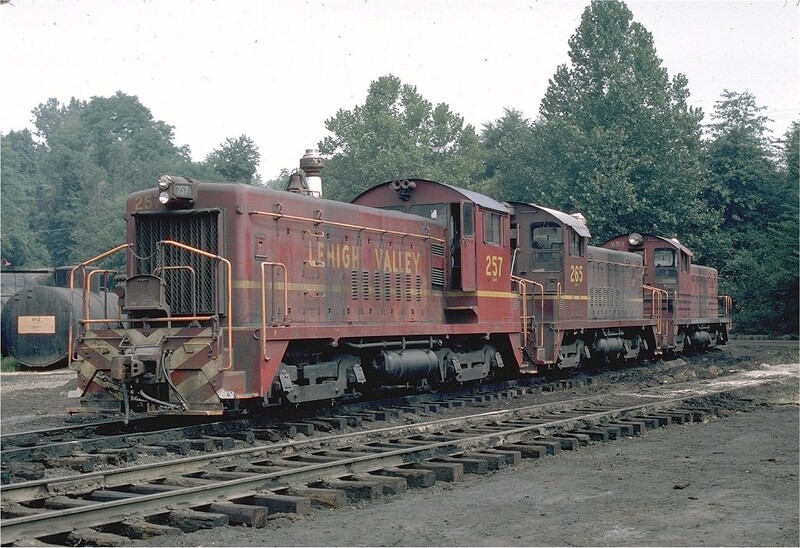 269 14494 9/1951 Never repainted to another scheme To CR as 8683 Y 2 2 10-74 photo by Gary Steuben on George Elwood’s web site. 270 14495 9/1951 Never repainted to another scheme To CR as 8684 Y 2 2 Arnold Morscher photo on his web site. 271 14496 9/1951 7/1974 – Style # 11:Late Cornell Red, yellow stripe, no herald, gothic lettering. To CR as 8685 Y 2 2 Had original split front railing as late as July 1973, but a straight front railing & no drop step in post-1974 photo by Rich Jahn. 273 14498 9/1951 4/1974 – Style # 11:Late Cornell Red, yellow stripe, no herald, gothic lettering. To CR as 8687 Y 2 2 Still has MU, but a straight front railing & no drop step in photos after 4/74. 1. Dates in italics are estimates based on dates of available photos, and are subject to revision as new evidence comes to light. Non-italicized dates are actual repaint dates stenciled on the locomotives. 2. Paint style numbering system from Carl Steckler’s book. 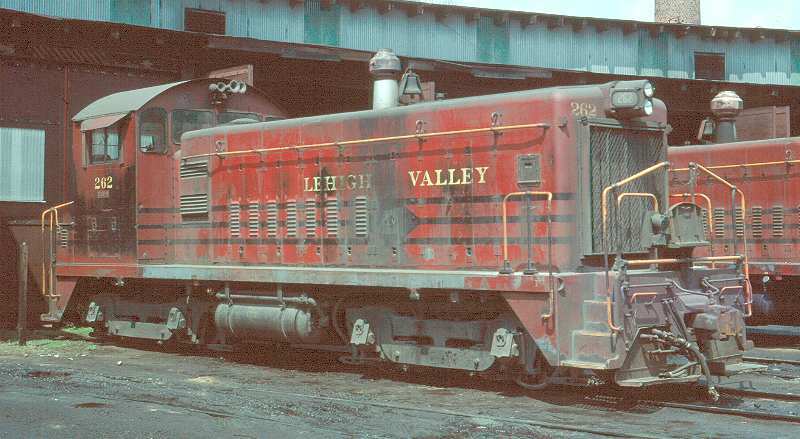 Lehigh Valley Railroad Diesel Paint Schemes (1925-1976), by Carl Steckler. 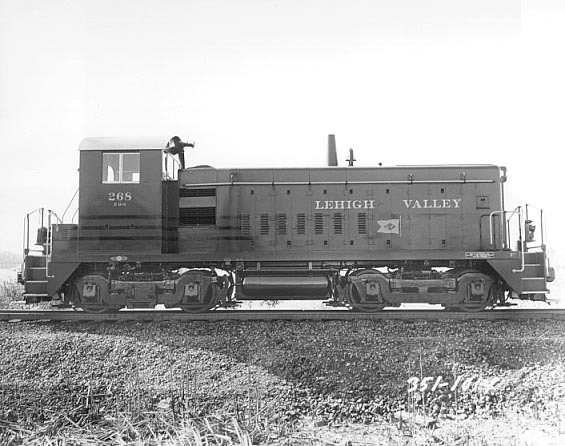 Lee’s 261 is an Atlas O scale model modified to a LV pup circa 1960-61. Lee added the dynamic brakes from styrene and modified the pilots for the LV’s MU configuration. I built mine by chopping out the area which is white in the photo and building up the hood/louvers etc in that area with styrene. The 1 ft or so of horizontal surface between the dynamic area and the cab is the original Proto 2000 shell filed flat – there’s just enough material. After much fiddling about with individual louvers I finally made the louvered part by scribing grooves using a hook-like cutter intended for scribing laminates. It is made by Olfa in Japan and produces a V-shaped groove, which isn’t correct but looks OK to me. I have attached a photo of the cutter – the scribing is done with the lowest point of the blade by pulling the handle towards you. It took a lot of very careful attempts before I managed to get a strip with all the grooves the same size. I scribed a long enough strip to make the dynamics for 3 Pups of which I’ve only started one so far. The diamond-mesh at the bottom of the air-intake is etched brass from a company here in England.